Pathogenic keratinophillic fungal attacks of keratinous structure (skin, hair & nail), due to fungi ability to use keratin, causing ring worm disease or tinea. Econazole nitrate 1% = 1-[2-(2,4dichlor - phenyl)-2-(4-chlorbenzyloxy)-ethyl]midazol nitrate. Otitis externa mycotica - mycosis of the auditory canal Contraindications None of record Tolerance and side effects PEVARYL is readily tolerated even by sensitive skins. Local irritations are extremely infrequent and may occur for example t on eczematous skin areas. 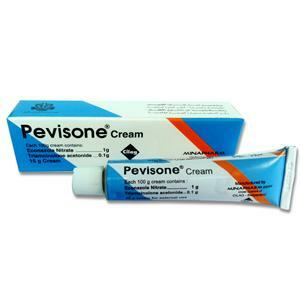 In such cases it is advisable to apply an antieczematous therapy a few days prior to treatment with PEVARYL. 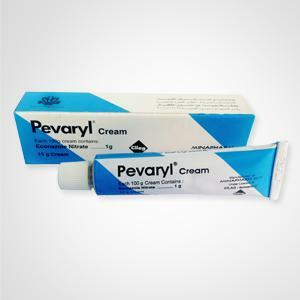 (unless otherwise prescribed by the physician) PEVARYL is applied to the affected skin regions in the morning and evening and, using a finger, lightly massaged into the skin. Intertriginous areas (e. g., interdigital spaces , gluteal folds) in an oozing state should initially be kept dry with strips of gauze or gauze bandage. In the treatment of onychomycoses the use of occlusive dressings is recommended. PEVARYL (Spray- ) Powder is used to support the PEVARYL Skin Cream, (Spray-) Solution and Skin Lotion therapy, as well as for follow-up and prophy-Lactic treatment. 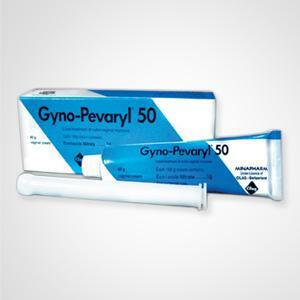 In cases of intertrigo , for example, the application of PEVARYL in powder from alone may be sufficient. Because Econazole is Fungicidal, Sporicidal & Bactericidal. 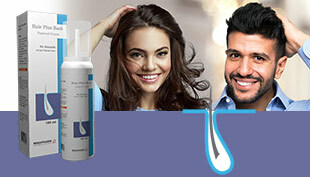 It have a rapid drying effect and does not stain.